Background: We have previously shown that angiotensin converting enzyme (ACE) DD genotype is associated with exaggerated pulmonary hypertension and disturbance of tissue oxygenation during exercise in patients with chronic obstructive pulmonary disease (COPD). A pilot study was designed to examine the effects of captopril on these exercise related variables in COPD patients categorised according to ACE gene polymorphisms. Methods: Thirty six patients with COPD (II=13, ID=11, DD=12) received oral captopril (25 mg) or placebo in a randomised, double blind, crossover manner and underwent right heart catheterisation with exercise. Results: Mean pulmonary arterial pressure (mPAP), pulmonary vascular resistance (PVR), and lactate concentration after exercise with both placebo and captopril were higher in patients with the DD genotype than in those with the II or ID genotypes. In contrast, mixed venous oxygen tension (Pvo2) was lower in patients with the DD genotype than in those with the other genotypes. Moreover, mPAP, PVR, and lactate concentration after exercise were lower in the captopril group than in the placebo group in patients with the II or ID genotype, but not in those with the DD genotype. Pvo2 after exercise was higher with captopril than with placebo in patients with the II genotype, but not in those with the other genotypes. Conclusions: These findings suggest that pulmonary haemodynamic variables and state of tissue oxygenation during exercise are dependent on ACE genotypes, and that captopril administration effectively influences these exercise related variables. Although the sample size in this pilot study was limited, it is likely that the improvement in exercise related variables in COPD patients with the II genotype is relatively sensitive to captopril. The angiotensin converting enzyme (ACE) gene contains a polymorphism based on the presence (insertion (I)) or absence (deletion (D)) within an intron of a 287 base pair nonsense DNA domain resulting in three genotypes (DD and II homozygotes, and ID heterozygotes).1 We have previously found that the ACE DD genotype is associated with exaggerated pulmonary hypertension and disturbance of tissue oxygenation during exercise in patients with chronic obstructive pulmonary disease (COPD).2,3 Treatment of patients with pulmonary hypertension secondary to COPD is currently problematic. Calcium channel antagonists have only been effective in improving the cardiovascular haemodynamics of patients with primary pulmonary hypertension,4 but there is no evidence of their efficacy in treating secondary pulmonary hypertension. Similarly, the use of ACE inhibitors in secondary pulmonary hypertension has been abandoned since they have failed to show any consistent or clinically significant effect. However, no study has compared the pulmonary haemodynamic responses to ACE inhibitors in patients with secondary pulmonary hypertension with different subtypes of the ACE gene. This preliminary study was therefore designed to examine the effects of captopril on pulmonary haemodynamics and tissue oxygenation during exercise in patients with COPD categorised according to ACE gene polymorphisms. Thirty six patients with COPD (all men) from the respiratory outpatient clinic of our institution were enrolled in the study. All patients satisfied the American Thoracic Society criteria for COPD.5 Patients with evidence of coronary artery disease, valvular heart disease, systemic hypertension, or primary myocardial disease were excluded from the study. None of the patients had radiological or clinical evidence of pulmonary congestion or right heart failure. Concomitant left ventricular dysfunction was excluded in all patients by echocardiography and determination of pulmonary wedge pressure (PWP) at rest and during exercise. All patients with COPD were clinically stable, and none had a history of respiratory infection for at least a 4 week period preceding the study. Genomic DNA was extracted from peripheral blood leucocytes by standard methods. The ACE genotypes of all subjects were determined by polymerase chain reaction using the primers and methods previously described.6 The investigators were blinded to genotype until all data had been collected. All patients gave their written informed consent for participation in this study, which was approved by the ethics committee of Osaka City University, Japan. On the first day of the study the subjects underwent a progressive incremental exercise test while sitting on an ergometer (Siemens EM840, Germany), starting at 0 W for 3 minutes and adding 10 W every minute until the symptom limited maximum was reached. The purpose of this incremental exercise test was to determine the maximal exercise capacity. On the day after the test all subjects underwent right heart catheterisation. A balloon tipped pulmonary arterial catheter was inserted into the internal jugular vein and advanced into the pulmonary artery for measurement of pulmonary arterial pressure (PAP) and PWP and sampling of mixed venous blood. In addition, a plastic catheter was placed into the brachial artery to monitor systemic arterial pressure and to sample systemic arterial blood. The heart rate and rhythm were monitored continuously. PAP was measured using a transducer (Baxter UK901, Tokyo, Japan) located at the level of the anterior fourth intercostal space with the patient sitting upright and recorded on photographic paper. Pressures were averaged over three respiratory cycles. Mean pressures were obtained by electronic integration. Cardiac output was determined by the thermodilution method using a Fukuda Denshi Cardiac Output computer. Arterial oxygen tension (Pao2) and mixed venous oxygen tension (Pvo2) were measured with a blood gas analyser (Model IL 1312; Instrumentation Laboratory). The blood was rapidly deproteinated in iced perchlorate solution and, after centrifugation, analysed for lactate concentration by an enzymatic technique. Resting haemodynamic and blood gas data were obtained about 20 minutes after the patient had been seated comfortably on the ergometer. Each patient then performed a constant load exercise test for 5 minutes while on the ergometer at a workload corresponding to 60% of the previously determined maximal workload.7,8 Haemodynamic and blood gas measurements were performed during the final minute of constant load exercise. The study was performed as a double blind, randomised, placebo controlled, crossover trial. All subjects received either captopril (25 mg orally as a single dose; Sankyo Pharmaceuticals, Tokyo, Japan) or placebo, and performed the constant load exercise test 30 minutes after treatment.9 On a consecutive day, each subject received the alternative treatment and repeated the exercise test using the above described protocols. All values are presented as means (SD). Differences between the placebo and captopril groups are presented as mean differences with 95% confidence intervals (CI); a paired t test was used to compare group means. Multiple comparisons between the three groups of ACE genotypes were analysed by one way analysis of variance (ANOVA). The significance level was set at p<0.05. There were 13 patients with the II genotype, 11 with the ID genotype, and 12 with the DD genotype. The three subgroups were well matched for age, baseline lung function, arterial blood gas data, and maximal workload. The mean PAP (mPAP), PVR, Pvo2, and lactate concentration at rest did not differ significantly between the three groups with either captopril or placebo; captopril did not significantly affect these variables at rest in any of the three groups. However, after exercise mPAP was significantly higher in patients with the DD genotype (placebo: 53.7 (3.7) mm Hg, p<0.0001; captopril: 52.7 (2.6) mm Hg, p<0.0001) than in those with the II (41.1 (3.8) mm Hg; 37.8 (3.8) mm Hg) or ID genotypes (46.2 (5.9) mm Hg; 41.4 (5.8) mm Hg; fig 1). Moreover, mPAP after exercise was significantly lower with captopril than with placebo in patients with the II genotype (mean difference 3.308; 95% CI 2.405 to 4.210, p<0.0001) or the ID genotype (mean difference 4.818; 95% CI 4.231 to 5.405, p<0.0001), but not in those with the DD genotype. 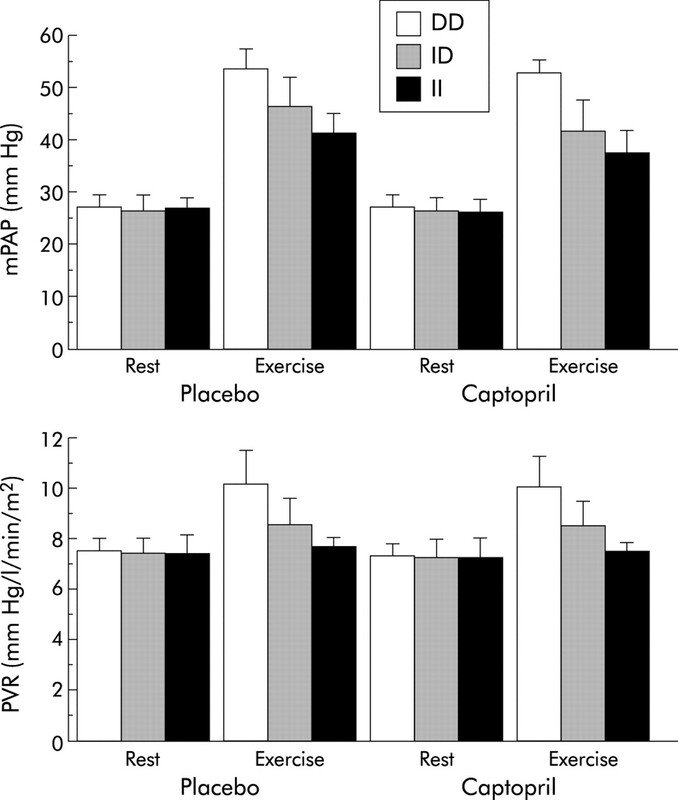 Comparison of mPAP and PVR at rest and after exercise with placebo or captopril in patients with the II, ID, or DD genotypes. PVR after exercise was significantly higher in patients with the DD genotype (placebo: 10.2 (1.29) mm Hg/l/min/m2, p<0.0001; captopril: 10.1 (1.10) mm Hg/l/min/m2, p<0.0001) than in those with the II (7.65 (0.38) mm Hg/l/min/m2; 7.39 (0.40) mm Hg/l/min/m2) or ID genotype (8.58 (0.99) mm Hg/l/min/m2; 8.40 (0.98) mm Hg/l/min/m2). PVR after exercise was also significantly lower with captopril than with placebo in patients with the II genotype (mean difference 0.257; 95% CI 0.150 to 0.364, p=0.0002), but not in those with the ID or DD genotypes. Pvo2 after exercise was higher in patients with the II genotype (placebo: 28.5 (2.3) mm Hg, p<0.0001; captopril: 30.2 (2.0) mm Hg, p<0.0001) than in those with the ID genotype (26.0 (1.7) mm Hg; 26.8 (2.1) mm Hg) or DD genotype (23.2 (1.7) mm Hg; 23.2 (1.9) mm Hg; fig 2). After exercise Pvo2 was significantly higher with captopril than with placebo in patients with the II genotype (mean difference –1.615; 95% CI –2.293 to –0.938, p=0.0002) but not in those with the ID or DD genotypes. 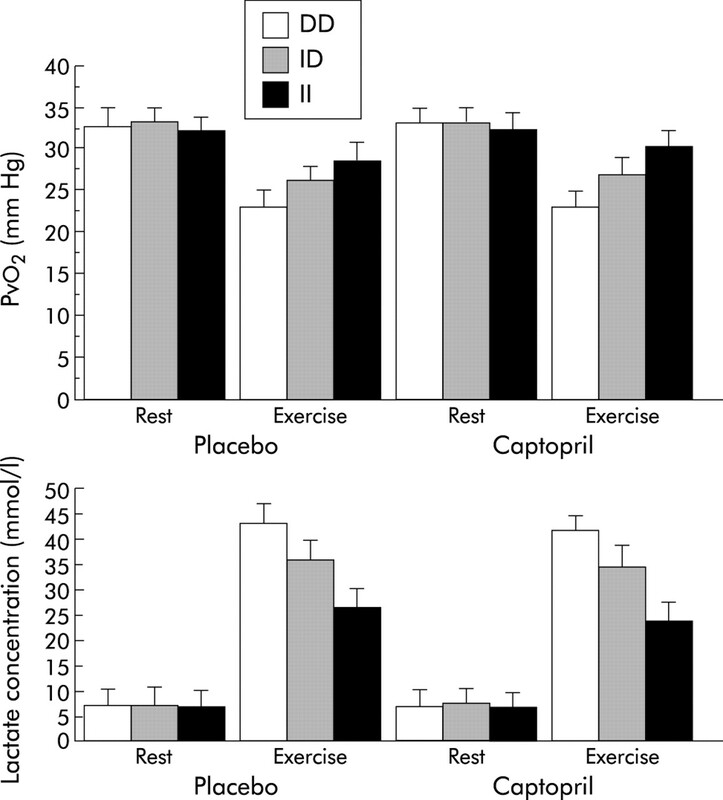 Comparison of Pvo2 and lactate concentration at rest and after exercise with placebo or captopril in patients with the II, ID or DD genotypes. Lactate concentration after exercise was lower in patients with the II genotype (placebo: 26.5 (3.6) mmol/l, p<0.0001; captopril: 23.7 (3.7) mmol/l, p<0.0001) than in those with the ID genotype (35.7 (4.0) mmol/l; 34.5 (4.0) mmol/l) or DD genotype (42.7 (3.9) mmol/l; 41.8 (2.8) mmol/l). The lactate concentration after exercise was significantly lower with captopril than with placebo in patients with the II genotype (mean difference 2.769; 95% CI 1.370 to 4.168, p=0.001) or ID genotype (mean difference 1.273; 95% CI 0.186 to 2.360, p=0.026), but not in those with the DD genotype. In this study three issues are addressed: (1) Do exercise related variables differ with the different subtypes of the ACE gene? (2) Does captopril have an effect on exercise related variables? (3) Are the effects of captopril dependent on ACE genotypes? We found that pulmonary haemodynamic variables and state of tissue oxygenation at rest did not differ significantly in the three groups with placebo or captopril. However, mPAP, PVR and lactate concentration after exercise were significantly higher in patients with the DD genotype than in those with the II or ID genotypes. In contrast, Pvo2 after exercise was significantly lower in patients with the DD genotype than in those with the other genotypes. These findings suggest that these exercise related variables differ according to the subtype of ACE gene. mPAP, PVR, and lactate concentration after exercise were significantly lower with captopril than with placebo in patients with the II or ID genotypes, but not in those with the DD genotype. In contrast, Pvo2 after exercise was significantly higher with captopril than with placebo in patients with the II genotype, but not in those with the other genotypes. Thus, although captopril administration did not significantly change pulmonary haemodynamic variables and the state of tissue oxygenation at rest, it effectively influenced these variables after exercise in patients with COPD. The hypothesis that the effects of captopril on these exercise related variables are dependent on ACE genotypes is attractive. It seems likely that the magnitude of improvement in pulmonary haemodynamic variables and state of tissue oxygenation after exercise in response to captopril administration was the II>ID>DD genotype. These findings suggest that the improvement in exercise related variables in COPD patients with the II genotype is relatively sensitive to captopril. However, no time course study was performed. The presence or absence of the effects of captopril in the subtypes of ACE gene, even if shown, may in reality be related to differences in the time course of the responses. Thus, it may be that onset and time to maximal effect of captopril is dependent on the ACE genotype. Moreover, there are other explanations for the findings in this study. For example, ACE inhibitors have recognised effects of vascular compliance which might account for differences in mPAP during exercise in the ACE gene subtypes. In addition, the metabolic effects of kinins and angiotensin II may partly account for differences in lactate concentration during exercise by ACE genotypes. Further studies are required to clarify these issues. Although this pilot study had a limited sample size, identification of ACE gene polymorphisms may be useful for predicting the clinical efficacy of captopril treatment in individual COPD patients. Since the effects of a single administration of captopril appear to be rather small, pulmonary haemodynamic responses to high doses or long term administration of ACE inhibitors in patients with different ACE gene subtypes should be examined in future studies. The authors thank Miss Yukari Matsuyama for her help in the preparation and editing of the manuscript. This work was supported by grant-in-aid for Scientific Research (13670611) from the Ministry of Education, Science and Culture, Japan. Rigat B, Hubert C, Corvol P, et al. PCR detection of the insertion/deletion polymorphism of the human angiotensin converting enzyme gene (DCP1) (dipeptidyl carboxy peptidase 1). Nucleic Acids Res1992;20:1433. Kanazawa H, Okamoto T, Hirata K, et al. Deletion polymorphism in the angiotensin converting enzyme gene are associated with pulmonary hypertension evoked by exercise challenge in patients with chronic obstructive pulmonary disease. Am J Respir Crit Care Med2000;162:1235–8. Kanazawa H, Otsuka T, Hirata K, et al. Association between the angiotensin converting enzyme gene polymorphisms and tissue oxygenation during exercise in patients with chronic obstructive pulmonary disease. Chest2002;121:697–701. Rich S, Kaufmann E, Levy PS. The effect of high doses of calcium-channel blockers on survival in primary pulmonary hypertension. N Engl J Med1992;327:76–81. Ueda S, Heely RP, Lees KR. Mistyping of the human angiotensin-converting enzyme gene polymorphism: frequency, causes and possible methods to avoid errors in typing. J Mol Endocrinol1996;17:27–30. Puente-Maestu L, Sanz ML, Sanz P, et al. Reproducibility of the parameters of the on-transient cardiopulmonary responses during moderate exercise in patients with chronic obstructive pulmonary disease. Eur J Appl Physiol2001;85:434–41. Fukuoka Y, Grassi B, Conti M, et al. Early effects of exercise training on Vo2 on- and off-kinetics in 50-year-old subjects. Eur J Physiol2002;443:690–7. Bertoli L, Lo Cicero S, Busnardo I, et al. Effects of captopril on hemodynamics and blood gases in chronic obstructive lung disease with pulmonary hypertension. Respiration1986;49:251–6.